Slated to be one long rave along a 5km route, Siew Mai and I participated in the inaugural Illumi Run on 7 Dec. 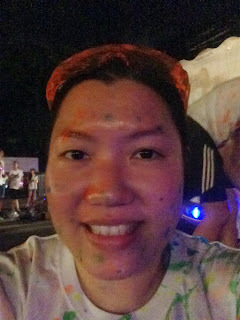 It's the 1st night run I've participated in and also the 1st one where I paid $68 to be splashed with paint by random strangers. These 2 girls just came up to me from the back and pressed their palms on my left shoulder and arm. I think you can barely see the imprint of one of their palms. My favourite part of the walk/run was the last leg where I dub it as the "tunnel rave". Featuring DJ Atran, it was really the best part for a clubbing scene. I was telling Siew Mai as we were about to walk into the tunnel that this would be a great place to put speakers cos of the natural acoustics of a tunnel. Lo and behold, the organisers had the same thoughts! Really splattered with paint and overall, it was the most fun 5km walk that I've ever done! The paint was water soluble so it came out immediately in the shower although the paint that was splattered in my right ear took another day of digging.